Cape Town - Global ice cream specialty giant Baskin-Robbins is set to hit South Africa with its first shop opening in Cape Town in December. The company was founded in the US 70 years ago and also offers customised ice cream cakes and a range of beverages. South African franchise holder Grand Foods made the official launch announcement on Tuesday. The first shop will be at the Canal Walk Shopping Centre in Cape Town on December 9. South Africa is the 51st country to which the Baskin-Robbins brand expands. The aim is to have six to nine stores in the Western Cape by the middle of 2017 and then to aim for Gauteng. All the shops will be company owned. Sean Dearham, chief operating officer of Baskin-Robbins South Africa, said the demand for artisanal ice cream and a variety of flavours is on the rise in the SA market. He said, “Although the first shop will be in a mall, the focus will still be on remaining a neighborhood - focused ice cream shop”. “With more than 1 300 different flavours to choose from, our brand is able to differentiate itself from competitors. 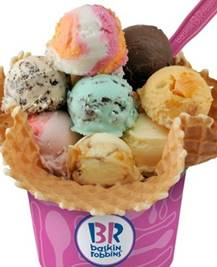 Baskin-Robbins is best known globally for its ‘31 flavours’ - a different flavour for each day of the month. We also want to make local 'lekker'," said Dearham. According to Euromonitor the volume consumption of ice cream in South Africa was sitting at 59.5 million kilograms in 2014, and is projected to maintain a moderate growth forecast. "Baskin-Robbins is about innovation and fun. We want to offer a continuous journey of taste and more innovative flavours will be coming in the future," said Dearham. He added that, at the moment, all the ice cream used is imported. The aim is, though, to grow the local supply for the brand. Rozanna Kader, marketing and communications executive at Grand Foods, said the reason for choosing Canal Walk for the first SA store is that it is the biggest mall in the Western Cape and shops are open till late. Baskin-Robbins have neither applied to or hold any Halaal certification from SANHA. They claim that the products which are available in 1 300 flavour variants are imported. SANHA has written to the company requesting relevant information and until this is received and evaluated, SANHA is unable to give any assurance on its status.